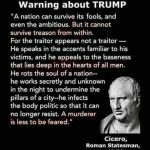 Cicero was right then, and he is right now! 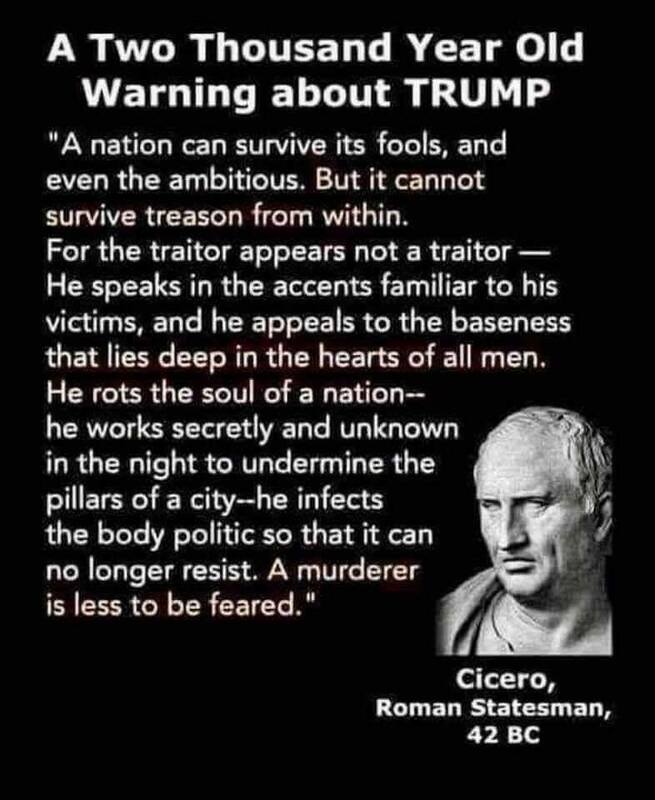 Click on Cicero graphic for easy reading. Please vote on November 6, 2018. Remove the members of Congress from office if they support Trump the Traitor, the Pathological Liar, the Bigot, the Racist, the Violator of Human Rights, the Committer of Crimes Against Humanity, and a Denier of Climate Change. I accuse Donald J. Trump of Treason. Putin showed disrespect for his lackeyTrump by making him wait one hour for their scheduled meeting. Trump committed treason by violating Article III. Section. 3. of the Constitution of the United States “adhering to their Enemies, giving them Aid and Comfort.” Trump gave Aid and Comfort to President Vladimir Putin and the Russian Federation, the enemy of the United States of America, by his disgraceful-international-televised press conference broadcast internationally while standing next to Putin in Helsinki, Finland on 16 July 2018. Trump said, “As I said today and many times before, I have great confidence in my intelligence people.” Asked whether he believes his intelligence agencies, which said that Putin ordered Russian military intelligence agents to interfere in the 2016 United States Presidential election, or Mr. Putin, who denies it? Mr. Trump refused to say, but he expressed doubt about whether Russia was to blame. Trump, the coward, did not confront Putin for interfering in the 2016 election, because it would have cast doubt on Trump’s win in the Electoral College. Trump lost the popular vote by more than three million votes. Putin offered to have Russian intelligence agencies work with their American counterparts to get to the bottom of the interference in the 2016 U.S. Presidential Election. “I think that’s an incredible offer,” Trump said. Not an incredible offer! Only, an uninformed, naive Trump would believe it. The Russian agents would discover how the U.S. intelligence agents determined Putin ordered the interference in the 2016 Presidential Election. Then, the Russian agents pursuant to Putin’s orders will change their tactics for the next assaults on our democracy in 2018 and 2020. Putin will interfere in future U.S. elections to try and return his coward, his pawn, his sycophant, and his traitor, Trump, to another term as president. Trump betrayed the American People, his country, the U.S. intelligence agencies which overwhelming confirmed Putin ordered the interference in the 2016 Presidential Election to benefit Trump when he said he believed Putin did not interfere. Putin said he wanted Trump to win. The president’s motive was to fight for the legitimacy of his victory in the 2016 election. In the process, he impugned and demonstrated his lack of integrity, the nation’s law enforcement agencies and publicly lied about the consensus view of its intelligence agencies that Putin ordered Russian military intelligence agents to interfere in the campaign. I accuse President Donald J. Trump of being a bigot and a racist and a violator of human rights. His predilictions have caused a rise in hate crimes since he took office. 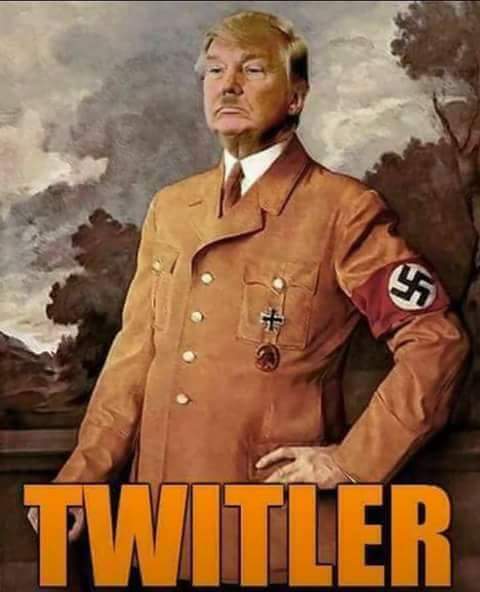 His role model as a bigot and racist are emboldening other bigots, racists, hate organizations, the Ku Klux Klan, neo-Nazis and their ilk to engage in violence against those who peacefully protest against their anti-Semitism, bigotry, and racism. Specific human rights include the right to personal liberty and freedom from discrimination on the basis of race. The president has stated the Hispanic people, and asylum seekers would “infest” our culture. The laws prohibit practices such as arbitrary detention, but the president ordered it. In many instances, the term implies an element of bad faith, and it may be used synonymously with tyrannical or despotic conduct which describes the president’s actions. The term arbitrary describes a course of action or a decision that is not based on reason or judgment but on personal will or discretion without regard to rules or standards, this the president has done. An arbitrary decision is one made without regard for the facts and circumstances presented, and it connotes a disregard of the evidence. The president has incarcerated and separated children from their families of asylum seekers and others whom have escaped with their lives from deadly environments. The president knows the life threating environments from which the Hispanics and asylum seekers have escaped and still incarcerates them, denies them asylum and violates the international and U.S. laws regarding human rights. I accuse Donald J. Trump of committing crimes against humanity. He should be punished for them. Madeline Albright in her book Fascism A Warning describes a demagogue trying to be a dictator. It exposes Trump for whom he really is. He is bypassing Congress and ruling by fiat, executive orders. Fiat is a command or act of will that creates something without or as if without further effort. Fiat is an authoritative determination: a dictate. Fiat is an authoritative or arbitrary order: an executive order. A government controlled by the president is a government by fiat. Trump has personally ordered unjust imprisonment, political repression, racial discrimination, and other human rights abuses. These may reach the threshold of crimes against humanity if they are part of widespread or systematic practice. They are, and Trump has committed these crimes against the children and their families seeking asylum in the U.S. Jesse Jackson, the civil rights leader, addressed Trump’s crimes, “The children have lost, the parents have lost, but we’ve lost moral authority. 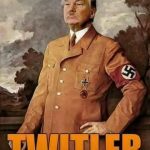 We’re now threatened by racial polarization, ignorance, fear, hatred, and violence.” Trump, along with other demagogues and dictators, are examples of man’s inhumanity to man. I accuse President Donald J. Trump of disregarding climate change because he has taken bribes from the fossil fuel industry. All of the climate change scientists agree the threat is real and a disaster waiting to happen to planet Earth. Donald J. Trump is invested heavily in the Fossil Fuel Industry. Trump told his deluded listeners during his campaign for president, he was so rich he did not need to take contributions for his election. Fossil fuel companies helped him shatter records in raising money for his inauguration festivities, according to the Federal Election Commission. More than 1,500 corporations and individuals gave a total $107 million to the presidential inaugural committee. That is more than double the $53 million raised for President Barack Obama’s then record-breaking inaugural in 2009. Among the big donors were Chevron, which gave $525,000; Exxon, BP, and Citgo Petroleum, which each donated $500,000; and the Ohio-based coal company, Murray Energy, which contributed $300,000. Kelcy Warren, the chief executive of Energy Transfer Partners, developer of the Dakota Access Pipeline, gave $250,000. Continental Resources, the Oklahoma-based fracking company whose chief executive Harold Hamm was an early Trump supporter, gave $100,000. The Trump inaugural committee offered top donors perquisites such as access to cabinet appointees at “leadership luncheons” and other events. The Fossil Fuel Industry certainly wasn’t the only sector contributing to the inauguration festivities. The committee recorded big donations from Las Vegas casino magnate Sheldon Adelson ($5 million), Microsoft ($500,000), American Financial Group ($500,000) and the health insurer Anthem ($100,000), among many others. But less than 100 days into his presidency, it already is clear that the Trump administration has allied itself with fossil fuel interests — embarking on a systematic effort to roll back restrictions on oil, gas and coal development and cut programs on climate change. As a result, of the pollution caused by deregulation, health care costs increased by billions. Another example of the power of bribes and a lack of consideration for the American People. Trump ended an environmental review of the Dakota Access pipeline, clearing the way for construction, four days after he took office. In addition to fossil fuel companies, some of the larger donors to the Trump inauguration were private equity titans who have major investments in oil, gas, and coal. Contributing $1 million each to the inauguration were: Henry Kravis, co-chairman and CEO of KKR, a major energy company investor, and Paul Singer of Elliott Management, whose firm has stakes in Marathon Petroleum, Hess Oil, and BHP Billiton. Private equity firms poured twenty billion into investment in U.S. shale oil and gas production this year, indicating they are betting on big growth for the sector, despite low oil and gas prices, according to financial data firm Prequin. Also, the National Rifle Association, NRA, gave Trump thirty million dollars. I accuse President Donald J. Trump and members of Congress of corruption. The Congress passed, and the president signed the $1.5 trillion in tax cuts in December 2017. It benefited overwhelmingly the president, members of Congress, and the wealthy in America and worsened inequality. There are no benefits in the bill for those people in the middle class or living in poverty. The United Nations released a report last month on the state of poverty in the United States — and it specifically criticized President Donald Trump’s policies. “For almost five decades the overall policy response has been neglectful at best,” the report states, “but the policies pursued over the past year seem deliberately designed to remove basic protections from the poorest, punish those who are not in employment and make even basic health care into a privilege to be earned rather than a right of citizenship. The report covers income inequality, voting rights, child poverty, mass incarceration, health care, racism, and stereotypes surrounding poverty. Trump told listeners at his campaign rallies, “All Americans will have health care and at a low cost.” The report finds that the U.S. is failing the poor, and in particular, focuses on last year’s Republican tax bill and other Trump administration goals, including repealing the Affordable Care Act and increasing defense spending. Trump has patently violated this fundamental premise of our democracy, aided and abetted by the Republican majority of Congress who continue to pass laws benefiting the wealthy to the detriment of those living in poverty. I only seek justice and truth.